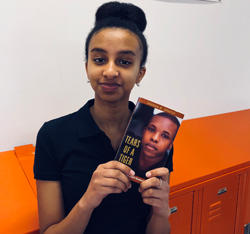 The 8th grade reading challenge is an incentive for 8th graders to reach their goal of reading 20 books by the end of the year, and some friendly competition for our avid readers. Students are challenged to read a variety of books independently, including books recommended by friends and staff, genres they have never read before, books than have won awards, etc. Students have until June to complete the challenge, and there are prizes for students who do complete it. If you are an avid reader yourself, talk to students about the texts that they are reading and make an effort to share book recommendations to students when you can! What students are saying about the 8th Grade Reading Challenge? Lwam H: The 8th Grade Reading Challenge is a really good way to expose students to many different types of books. The challenge requires students to look at and read books they might not have ever checked out themselves. In this generation, it is very important to be well read because with all the new technology, it’s much easier for adolescents like me to get distracted and fall short of developing a good reading habit. Reading helps with not only being able to be more fluent when reading much more challenging books, but it can help you become a better writer. Reading also opens us up to different ideas as well as expanding our imagination. Developing good reading skills can help in the future because it helps you become a better writer which can help with college essays as well as many other things. 3 books I would really recommend are, The Hate You Give by Angie Thomas, Takedown by Allison Van Diepen, and Tears of a Tiger along with the rest of the Hazelwood High trilogy by Sharon M. Draper. Cate H: The challenge is a fun way to get kids to read and it also expands your vocabulary and your imagination. In school you have to read books for classes and if you don’t develop good reading habits now then you could fall behind. Three books I would recommend are Wonder, Out of My Mind, and Throne of Glass. Alyssa L: It was a fun way to be able to read new genres and learn about different topics. Reading helps you learn about things that you may not experience in your life and it can introduce you to new words. As you get older, you will need to read more. In school, especially high school, you will be required to read different books to be able to pass a class. Learning to read on a daily basis can help you be able to get things done easier and faster. Three series i would recommend are the Deathnote, Shadowhouse, and Bakuman series.